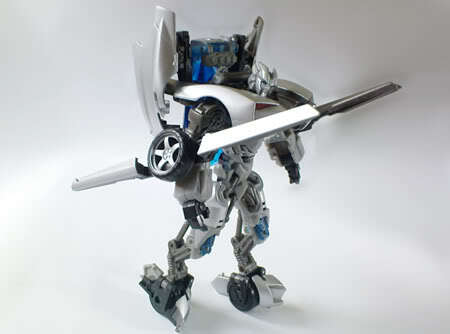 Among most of the latest Transformers Movie (Revenge of the Fallen) figure, Sideswipe "justify" my purchase. 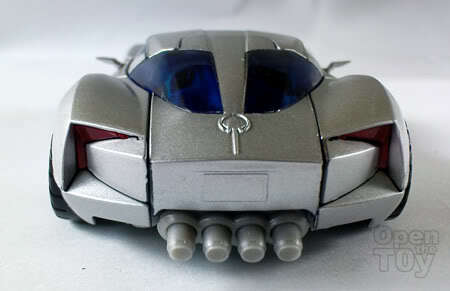 The vehicle mode does 40% of the convincing. Too bad it is just a concept car. Don't think will be seeing this car on the road of Singapore. :P Anyway on with the review of the toy. The presentation was capturing to allow customers to glaze on the beauty of the vehicle design. At the back of the packaging is pretty standard showing the robot mode of the Sideswipe. 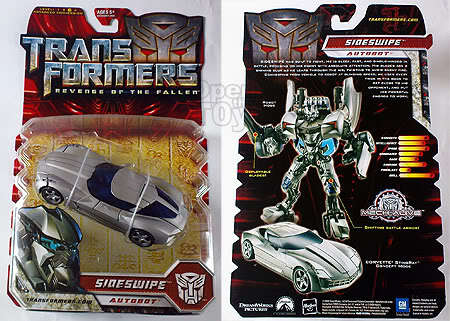 Although there the attributes of Sideswipe was printed there too, that doesn't make any sense to me. You mean people will likely to buy the figure based on the attributes of the robot such as strength, intelligence etc? Then they have Sideswipe face printed at the front of the card. That make me wonder again how many of us remember the faces of the Transformers in the movie? No really, try to picture the face of the transformers in your head right now, it is only likely you remember Optimus Prime, Megatron and Bumblebee faces? Plus of the faces printed on card art are not that accurate. 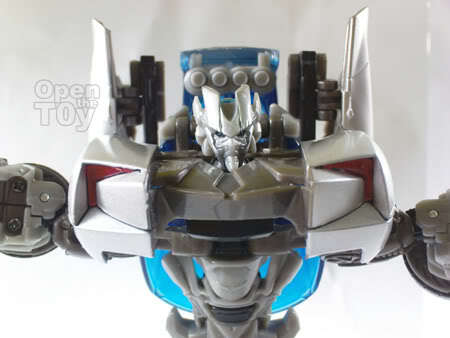 One example will be Smokescreen, that was just a repaint of Jazz but they drew a different head from Jazz but they did not do much changes on the toy head. How I know? I telly the card art with the toy figure picture at the back of the card. I was saying the 40% has to do with the vehicle design and so here it is. 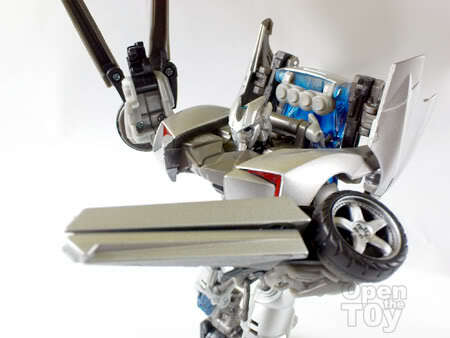 Another 10% has to do with the silver chrome painting which matches the former Premium version of Jazz. Now I don't think they will be a Premium of Sideswipe unless they have another weapons or part add on which maybe more accurate in the movie. That is IF they have such things. Another 40% rest on the robot mode. 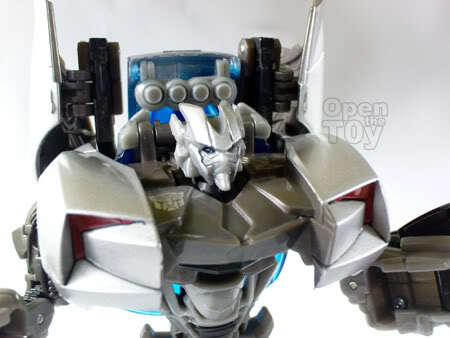 One of the few handsome robot mode from the entire movie collection in my opinion. Big chest, cool weapons and skinny leg. Well I would prefer to say it frog looking legs. Skinny yet muscular. Talking about legs, this figure has a feature "Shifting Battle Armor" at the knee part which will extend out when the legs are pull back in some position. Suppose to be cool but it did not wow me. For the upper body, it has the right preposition. 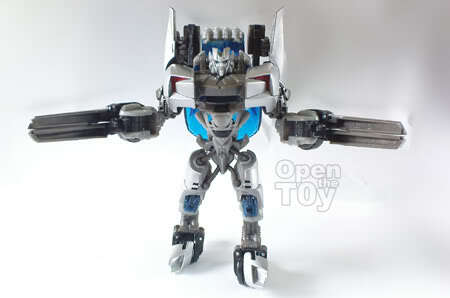 The face is handsome and board chest and big wings look very masculine. 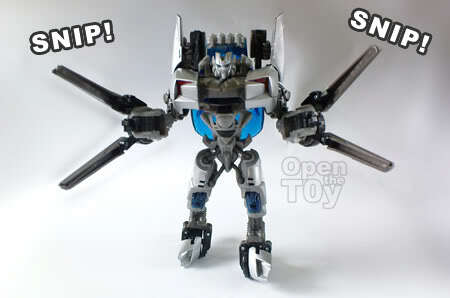 One and only weapons on this toy is his blades found on both of his arms. The pair of blades serves much as a scissors. According the movie, his blade act like a rotating blade than a scissor actually. There are some people who said Sideswipe look kinda like Barricade, so I decided to put them together to match. Do they really look like each other? 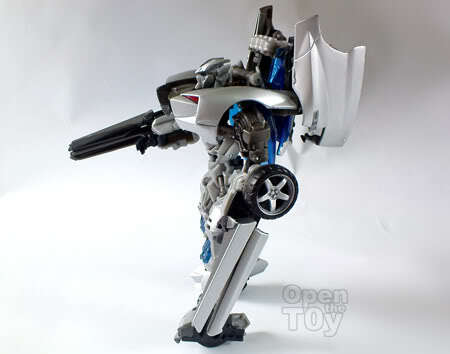 For me, I think Sideswipe was put in this movie to replace the fallen Jazz who was Silver, Sleek and cool from the previous installment. Overall I am happy about my purchase of this figure. 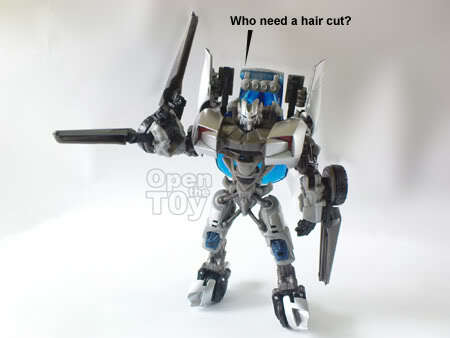 We need more discount instead Sideswipe. 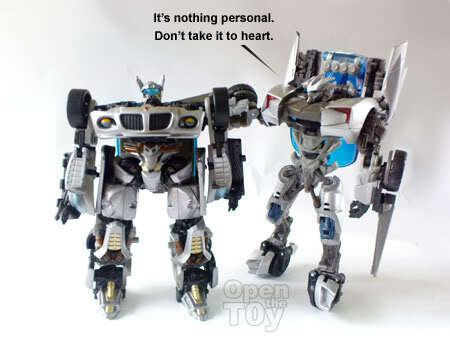 Ya too bad we didn't get to see more of Sideswipe in the movie, he's such a cool character with ninja moves. I regret not buying him during the sale when I saw him. Then when I wanted to get it, I couldn't find any! Along with BB, I haven't even seen BB since the sale started! Thanks for the pointers. 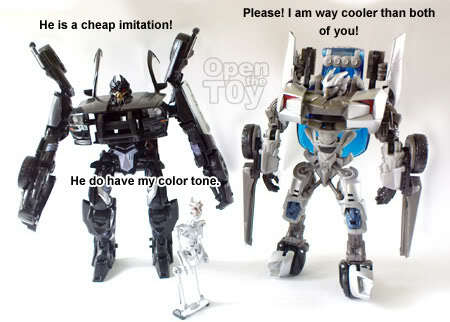 :) Sideswipe is indeed under-used. Not only him but some other autobots too! Maybe too much TF, too little time for the movie. BB and sideswipe is the popular ones. Optimus Prime will still be around due to the price tag. I saw some parent get BB Deluxe class for their kids. It is more economical. Dun worry, they will be plenty of BB around for everyone. 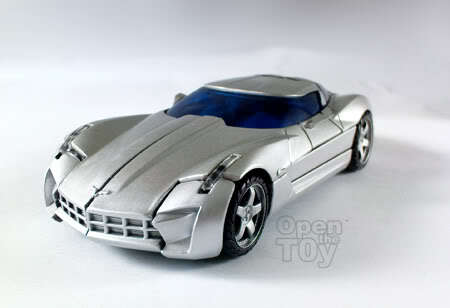 Maybe Sideswipe too. You are lucky to have discount there for TF most here selling at NETT price. I manage to get discount by credit card offer. Looks like of the good ones to me and now i know who he was in the movie. Want to pick up this one or either Bumblebee. Thx for the detail review and nice pics. Makes me want to buy it too + just watching the movie yesterday. Thanks Bro. Bumblebee you would have lot of choices for sure. 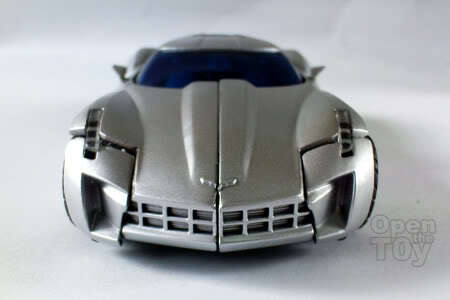 Sideswipe is worth getting for its design. Thanks. Where your movie review? Good to see you again KitKat. TF2 could be the best action pack movie of the year. Catch it if you can. 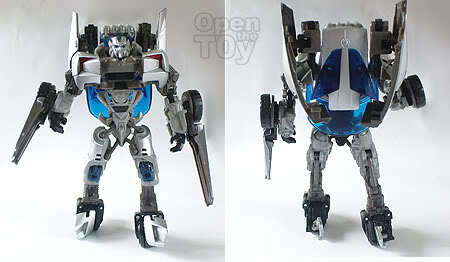 Leon, I think people talking about Sideways looks like Barricade, not Sideswipe..Very detailed review!! Thanks Desmond for the clarification. 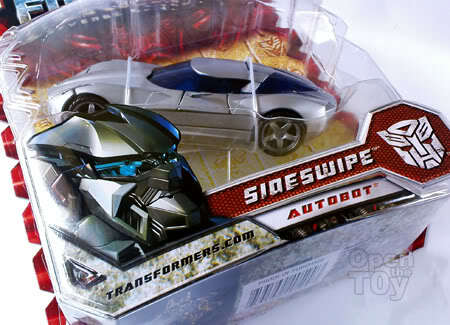 SideSwipe and sideway kinda sound the same. Both silver somemore. Easily confuse. LOL I am waiting for Sideway repaint tho.